Baskets, bunnies, brunch, and baseball! The Star in Frisco is hosting a Movie Night and a series of Easter-related events. Meanwhile, the Frisco RoughRiders have a series of their own and it comes with really cool promo nights. All of this and more… This Week in Frisco! To receive our two, exclusive, quick-read emails per week with WHAT TO DO, WHERE TO GO, and WHO TO KNOW in Frisco, you must subscribe via email… You don’t want to miss our articles, videos, podcasts, and event listings! Generation Adidas Cup: 9:00 am at Toyota Stadium. Watch the future stars of MLS from all over the world! GA Cup brings the best teams and most talented young players together to face off in the world’s most exciting and competitive youth tournament. Event runs April 13-20. All matches are free and open to the public. Coffee Talk with District Leaders: 8:00 am – 9:00 am at Lone Star High School. Frisco ISD parents are invited to share coffee and conversation with the Superintendent of Schools and a member of the School Board. Coffee Talks are held monthly in the library at FISD high schools. City Council Meeting: 6:30 pm – 9:00 pm at City Hall Chambers. Agendas are available prior to the meeting and minutes are available following approval. You can watch City Council meetings live, as well as view videos from past meetings. Frisco Arts Littles: Every Wednesday, from 10:30 am – 11:00 am at the Music Institute of North Texas. Do you want to introduce your 2-6 year old to the exciting world of music and art? Come join this fun musical experience with early childhood music specialist, Ms. Kelly Russell. Registration required. Easter at the Star: Celebrate Easter weekend at The Star in Frisco with a variety of events April 18-21. On Thursday, April 18, attend a Prestonwood Church Service, 6:30 – 7:30 pm and hear Tyler Toney speak about his faith and career as a member of Dude Perfect—the group of college buddies whose ridiculously-crazy sports trick shots struck a nerve with the world 10 years ago. Frisco RoughRiders: 7:05 pm at Dr Pepper Ballpark. Frisco RoughRiders vs. Midland Rockhounds, PLUS the Deep Ellum Brewing Party @The Yard, and Bark in the Park. Movie Night at The Star: 5:00 pm – 9:00 pm at The Star in Frisco. An outdoor showing of the movie Incredibles 2 at 7:00 pm in Tostitos Championship Plaza. Before the movie, enjoy free family-friendly activities. Music in the Chamber: 8:00 pm at Council Chambers, George A. Purefoy Municipal Center. Monthly event. Each intimate concert will be held in the Council Chambers, a state-of-the-art acoustically designed space by architects involved with NYC’s Radio City Music Hall. Clean It and Green It: 8:00 am – 1:00 pm at Simpson Plaza in Frisco Square. As a Keep Texas Beautiful Affiliate, the City of Frisco participates in the Great American Clean-Up. To reward our volunteers’ hard work, the City of Frisco throws the volunteers a family-friendly party with food, face painting, bounce houses, games, and more! Frisco Rotary Farmer’s Market: 8:00 am – 12:00 pm at 8821 4th Street. Every Saturday from April 20 – October 26 shop farm-fresh produce, meats, eggs, baked goods, preserves, fresh flowers, soap, handcrafted items and more. On April 20, enjoy the season’s kick-off with music from 9:30 – 11:30, free Yoga on Main at 10:00 am, and a face painter. Easter Egg Hunt at The Star: 10:00 am on Tostitos Championship Plaza for an egg hunt for ages 2-6 and 7-12. Following the egg hunt, enjoy photos with the Easter Bunny, face painting and an inflatable. While you’re there, check out Easter Brunch Specials being offered throughout The Star District. Elevate Life Church Easter at the Cathedral and Outdoor Festivities: 10:00 am – 2:00 pm, come out for an Egg Hunt with over 100,000 filled eggs (remember to bring a basket). In addition, a full classic car, truck, and motorcycle show presented my Mustang Sally, multiple bounce houses, food trucks, and family activities, plus get your picture taken with the Easter Bunny. Free event. Beatles, Bistro, and Ballet: An evening of dance presented by Collin County Ballet Theatre. The performance will feature a new ballet set to popular Beatles songs and the historic Gaite Parisienne which depicts the lively night life in the Paris bistros of the 1900’s. Texas Revolution: 7:00 pm at The Ford Center. Texas Revolution vs. the Duke City Gladiators. Frisco RoughRiders: 7:05 pm at Dr Pepper Ballpark. Frisco RoughRiders vs. Midland Rockhounds, PLUS Skylit Saturday fireworks, and the Multicultural Festival. Easter Sunday Brunch at The Star: Stop by The Star for some Easter Bites available at many of your favorite restaurants. Brunch in Frisco: Look into some of these brunch-loving Frisco restaurants for Easter reservations or special menus. 3818 Attu Drive, Frisco, TX, 75033: Beautiful 2018 built Darling home on large cul de sac lot. Beautiful courtyard entry with iron gate. Gorgeous finishes throughout w modern lighting. Kitchen w granite and lg island w bkfst bar. Nook w dry coffee bar. 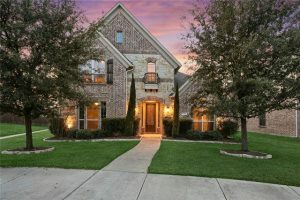 8270 Kentland Drive, Frisco, TX, 75034: Fabulous Darling built home w stone and brick exterior. Beautiful hardwoods. Large Kitchen is bright w white cabinets, subway tile, gorgeous quartz countertops, 5 burner cooktop, deep farm sink, nook and butler’s pantry. 4729 Upper Meadow Dr, Frisco, TX, 75036: Large corner lot! Beautiful wood flooring. Study with French doors. High ceilings in family rm open to upstairs balcony. Kitchen with gorgeous cabinetry, granite counters, double ovens, gas cooktop. 408 Macrocarpa Rd, Allen, TX, 75013: Gorgeous family home with modern accents and comfortable elegance. Wood flooring through entry, dining, and FR. Kitchen has 6 burner gas stove, high-quality granite, light cabinetry, large island w sink. Growing IQ: Help your child discover math concepts! Book a FREE math trial class with Growing IQ and get a 15% discount by mentioning “LIFESTYLE FRISCO” when you register. Practical Fitness: Get Ready for Summer 8-Week Challenge! Get a 1-hour consult, 16 private sessions, weekly nutrition support, and more for only 2 x $200. Visit the website or call 469.514.5733 now. Ideal Dental: Complimentary New Patient Exam with X-Rays or Laser Teeth Whitening at Ideal Dental in Frisco. The 12: Exclusive Founder’s Rate – $129/month for Unlimited Group Classes at The 12. Email Plano@The12.com. Cherry Blow Dry Bar: $10 OFF any prom package of your choice! Look here for package options and details. Conquer Fitness and Performance: Get a free 3-Day Pass! New clients get to try any 3 of our classes completely free. Get your pass here. Crafted: On Tuesday, April 16, get $10 OFF the Ladies Night Trays Workshop! Register now. Oasis Accents: Mention code LIFESTYLE25 and receive 25% off of all home decor, including home accessories, art, and furniture. Serendipity Labs: Enjoy a complimentary day pass OR 20% Off your first meeting. Tumbleweed TexStyles: Buy 1 Get 1 50% Off when you use code TWTLS. BEYOND Studios: Sign up for the New Client special, 2 Weeks of Classes for $59, and get a free nutrition coaching consultation when you mention Lifestyle Frisco. Jungle Joe’s: On weekdays from 2:00 pm to close, enjoy $2 off admission per child, plus BOGO 50% off meals at Joe’s Cafe. Countdown2Escape: Book with code C2ERETIRE to get 25% off weekday booking for groups of 4 or more before the current rooms retire for good on May 6th! Frisco School of Music and Performing Arts: $15 off yearly membership with lessons through July! See details; Expires May 26, 2019. 2019 Dallas Cowboys Draft Events April 25-27 at The Star in Frisco. This annual event provides football fans the opportunity to see current Dallas Cowboys players, members of the DC Cheerleaders and Dallas Cowboys Rhythm & Blue, and Dallas Cowboys mascot, Rowdy, while also enjoying live music, games and activities and the 2019 Dallas Cowboys Draft Day 5K fun run. Rustic Cuff Ladies Night: April 29, 5:00 pm at the gorgeous Rustic Cuff showroom at Legacy West. Need a graduation gift? Mother’s Day gift? Frisco Fastpacs is partnering with Rustic Cuff for a fun night of shopping and mingling with your gal pals. RC will donate a percentage of sales back to Frisco Fastpacs. Frisco Arts Red Carpet Concert Series: May 1, 6:00 pm – 9:00 pm at the Lincoln Experience Center. Enjoy the timeless music of Rodgers and Hammerstein with the talented singers of the UNT Opera program. HeartStories GNO: May 2, 6:30 pm – 9:30 pm. Find your confident spring style at this fashion show designed to equip real women to navigate this season with ease, both in clothing in and in life. Use discount code LIFESTYLE to register! 8th Annual Frisco StrEATS: May 11 in The Rail District. The longest running Annual Food Truck and Music Festival in Texas featuring the best food trucks the area has to offer, amazing music acts, unique shopping experiences, kids activities, and more! Entry into the event is FREE. Lifestyle Frisco is proud to be a sponsor of Frisco StrEATS! VIP Glam Night: May 31, 6:30 pm – 8:30 pm at the Lincoln Experience Center. An evening of cocktails, light bites, music, and shopping to benefit the Kids Who Shouldn’t Have Cancer Foundation.